this is the last of last week's photos with the coffee tray. and get her a treat. i feel like my outfit posts have become few and far between. even week day evenings at the beach. if i'm not in my swimsuit, i'm in one of my favorite summer dresses or denim cut-offs...all of which you've already seen. so bear with me as i soak up the last of summer. 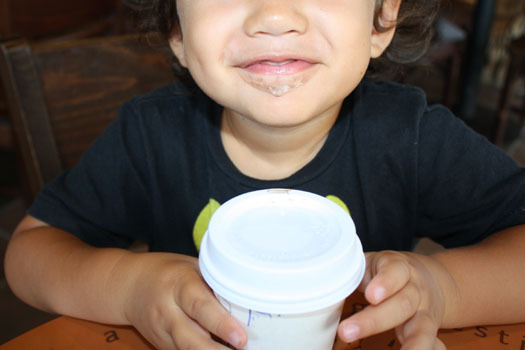 mini-he loves his starbucks, too. Ca-yute!! I love the dress with the crochet vest. Gorgeous dress! Love the arm band as well. You look great as usual?! hey girl...loving that maxi dress..and no worries on your enjoying last days of summer with your mini's..so cute! I am so sad about amy winehouse too..just did a blog post for her..I am impressed that you are a page turner. I only seem to read fashion or health magazines/books. I wish I could expand on that. enjoy! Thanks for your sweet comment! I'm in love with your dress! Also the watch is beautful! I saw you have more colors! Hi There! Thank you for stopping by www.bravoerunway.com! Gorgeous maxi dress! Love the jewellery! Great outfit! awww that is pure happiness on the mini's face! 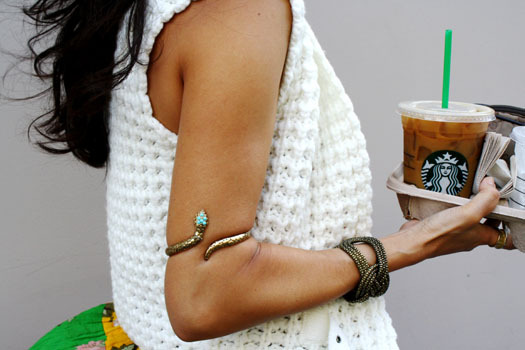 Your arm cuff is absolutely AMAZING. I have always wanted one. amazing pictures, the second pictures is so beautiful, looks like jak and jil took that pictures! Cute dress and vest. Please send some sun and heat my way! I could really use it about now. I love starbucks run!!! You're dress is absolutely gorgeous! You look stunning doll and what a cute pic of the Mini..adorable. That last picture is adorable - what a cutie! Love the pattern on your maxi and that amazing linked bracelet! your cup trays are definitely an statement accessory! love the outfit, those colors are super summery - but i have a feeling you can easily transition into fall too. Loving the upper arm candy and the maxi is simply great! The colors, the tiers, a bouquet indeed! Oh, this dress is gorgeous!! And I love the cuff on your arm! You look gorgeous!! Amazing dress!! That snake cuff is AMAZING! Love love love it. Thanks so much for stopping by my blog... following yours now! beautiful dress, love the accessories!! stars stripes and tie dye. sunny with a chance of.